This is a 1 year old demo pair of Rega RX-3 speakers. In excellent condition except for one small flaw/chip on the bottom right side of one speaker - see pics). They have very low hours and come factory box, manual, and warranty. Retail new these are $1,995/pair, this demo pair is yours for $1,150 plus shipping. The RX3 is a small speaker that works great in smaller to mid size rooms. It fairly efficient too and a easy 6 ohm load - works great with tube and solid sate gear. "The Rega RX-THREE loudspeaker system delivers balance, detail and dynamics thanks to a unique handmade set of three Rega designed drivers and crossover. The newly developed DX-125 bass mid-range driver (using a doped paper cone) is at the heart of the RX range and combines perfectly with the Rega ZRR high frequency and RR125.8 bass unit. These custom units are mounted in a newly designed cabinet enclosure constructed from 18mm MDF and covered in a choice of three, beautiful, real wood veneers. The RX-THREE will integrate perfectly into any home and deliver exceptional performance and musicality with a smooth and accurate bass response." 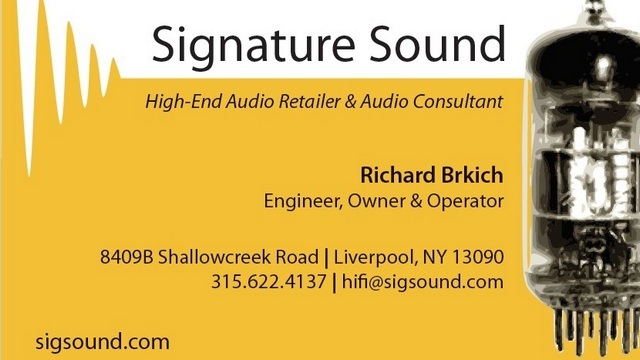 Signature Sound is a small Hi-End HiFi shop located near Syracuse New York. We have been in business since 1990. Feel free to check out our website www.sigsound.com or call us at 315-622-4137 with any questions. We accept all major credit cards and PayPal. A note to my fellow New Yorkers.... New York state residents (i.e sales billed/shipped to a New York State address) will be charged applicable local New York state sales tax on the total sale amount. Signature Sound is a authorized dealer for: Audience Cables, Atma-Sphere, Clearaudio, Cardas Cables, Benz Micro Cartridges, Fried Audio Speakers, DH Labs, Dynavector, EAR USA, Grado Labs, JPS Labs, Joule-Electra, iFi Audio, Merlin Music Systems, Musical Surroundings NOVA phono preamps, Power Modules (Belles), Rega Research, Rogue Audio (NEW! ), Running Springs Audio, Spendor Audio, Sonos, and Wavelength Audio. Follow us on Facebook to see our latest news, info, and sales/demo/used items for sale!